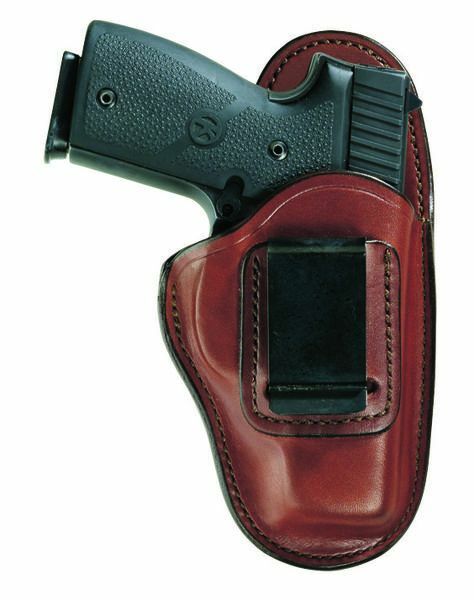 Bianchi 100 Sz 11 9mm, 40, 45acp, 10mm Holster - The Model 100 Professional holster is a comfortable inside-the-waistband design offering deep concealment. It rides at an optimum angle inside the waistband to ensure a secure fit and a proper firing grip on the draw. The high back provides a shield between the body and potentially sharp edges of the pistol for comfort and to protect clothing. A heavy-duty spring-steel belt clip safely and securely anchors the holster to the waistband or belts up to 1.75” wide. Made from premium full grain cowhide, the Professional holster features a non-slip suede-lined exterior that sits next to the body.